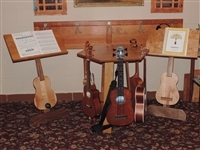 Keeping your ukuleles close will often lead to more playing time. Our carousels serve this purpose well. Talk about fun. Our bistro table will be your new entertainment spot . The top remains stationary while the lower carousel rotates to bring your current favorite instrument out to you. 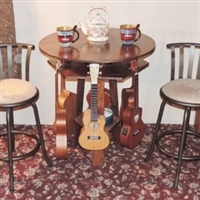 Designed to hold 6 ukuleles it is also available in a taller size to accommodate 3 guitars.